Al-Mohaimeed AA, Sharaf FK. Breaking Bad News Issues: A Survey Among Physicians. Oman Med J 2013 Jan; 28(1):20-25. Objective: The aim of this study was to explore the physicians' perspectives and practices in relation to breaking bad news (BBN) to patients. Methods: A quantitative survey was performed in the Qassim Region from January to July 2011. A cross-sectional study was conducted using a questionnaire administered to all practicing physicians working in both hospitals and Primary Healthcare centers in the Qassim Region. Anonymity was maintained throughout. The target groups received a self-administered questionnaire with a covering letter introducing the study and explaining their rights. Results: A total of 458 physicians participated in the study. Physicians with higher qualifications had lower total scores of the mean in BBN skills. The majority (70%) preferred to discuss information with close relatives rather than the patients. In case of serious diseases, only 32% said that they would inform the patient’s family without the patient’s consent. More than 90% of our study sample did not avoid telling their patients the bad news; however, physicians working in Primary Healthcare centers were less reserved. Conclusion: Although most of the participating physicians were keen to help their patients, they lacked the essential knowledge and skills for breaking bad news. Thus, they are in need of specific training in this regard. Keywords: Physician-patient communication; Breaking bad news; Saudi Arabia. In the Western culture the rights of individuals are considered paramount and are reflected in the patient autonomy models. Following this model, bad news is communicated directly and honestly to the patient, who is then able to choose whether or not to be actively involved in all aspects of decision-making about the management of their illness.11 Based on the autonomy model, guidelines for breaking bad news were developed by Rabow and McPhee,12 and later adapted by VandeKieft.13 Common features in these guidelines are a truthful explanation of a diagnosis with a poor prognosis, providing time to the patient to respond, and then offering support. In general, studies have shown that most of the the patients' complaints about doctors are related to issues of communication rather than clinical competency. Patients would like doctors who can diagnose and treat their illnesses as well as communicate with them effectively.19 In the West, a recognition that doctors may require further training to help them improve their communication skills, has led to the development of countless training courses and workshops on "how to break bad news" for undergraduates and postgraduates physicians. Most of the participants in these studies reported that the training courses were helpful. 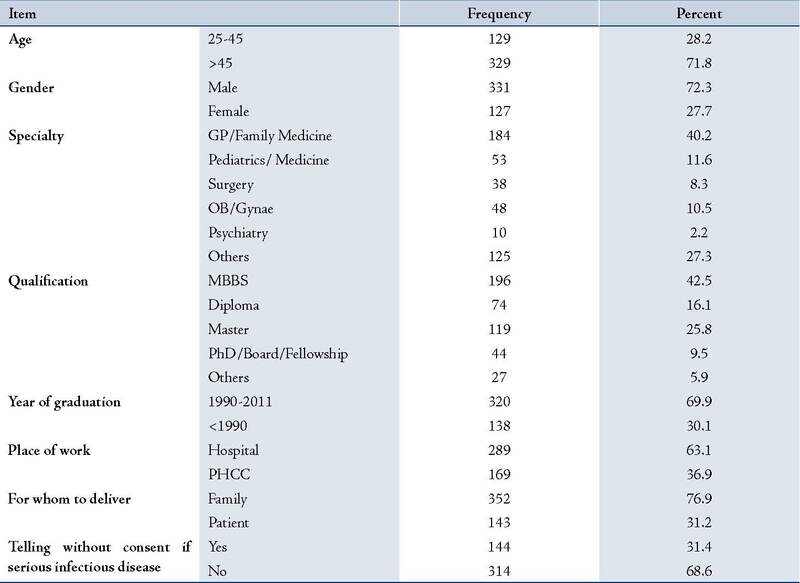 However, there is little empirical data to show that these courses lead to improvements that successfully translate into practice or that any measurable improvements are achieved over time.17 The aim of this study therefore, is to explore physicians' perspectives and their practices in relation to BBN to patients. A cross-sectional study was conducted in the Qassim Region from January to July 2011. A self-administered questionnaire was designed to elicit information on physicians’ knowledge and practices about breaking bad news to patients and their families. The questionnaire was sent to all practicing physicians working in public hospitals and primary healthcare (PHC) centers in the Qassim Region. We sent the questionnaires to hospital directors and administrators/supervisors of PHC centers, with the request to pass them on to the eligible respondents. Physicians not directly in contact with patients, for instance, forensic and public health physicians etc., were excluded from the study. Anonymity was maintained throughout. The respondents received a short and simple self-administered questionnaire in English, with a covering letter explaining the project and stating their rights as respondents to the survey. All items were verified and subjected to content validation by three major experts in communication skills. They were given copies of the questionnaire, as well as the purpose and objectives of the study. They evaluated the questionnaire on an individual basis. Comparisons were made between these evaluations and the questionnaire was slightly amended. The questionnaire was pretested on a small sample and modifications were made accordingly. Likert scale was used to explore physicians’ opinions and practices. A typical test item in this scale is a statement, the respondent is asked to indicate their degree of agreement with the statement. A five-point scale was used here.24 All questionnaires were coded and entered into an electronic database. For the purpose of analysis, the total score was computed as follows: strongly agree +2; agree +1; no difference 0; disagree –1; strongly disagree –2. Negative statements were re-coded using Statistical Package for Social Sciences (SPSS) to be treated in a similar way. Data analysis was carried out using SPSS version 12. Frequency distributions with numbers and percentages of all variables were produced. The study proposal was scrutinized and approved by the Medical Research Center of Qassim College of Medicine. An anonymous self-administered questionnaire was used and raw data were treated with strict confidentiality, and used only for research purposes. There were a total of 1,546 practicing physicians working in public health facilities in the Qassim region. The questionnaires with covering letters were sent to them all through their supervisors/administrators. However, only 458 completely filled questionnaires were returned (30% response rate). The primary reason for non-response was not the refusal to participate in the study, but that the respondents did not receive the questionnaire in the first place. Out of those who did receive the questionnaire, approximately 45% responded. For the purpose of this study however, we consider the response rate to be 30%. This was a cause for concern and we compared the profiles of our respondents with that of the non-respondents (Table 1). Information about the non-respondents was available through the Ministry of Health. There were significant differences between respondents and non-respondents with regards to all the variables except gender. Respondents were more likely to be working in PHC center, have no postgraduate qualification and working as general or family practitioners. Table 1: Characteristics of the respondents. Table 2: Mean knowledge scores by selected characteristics of the respondents. Table 3: Percentage distribution of responses to selected questions by age of the respondents. Table 4: Percentage distribution of responses to selected questions by place of work of the respondents. Table 5: Percentage distribution of responses to selected questions by qualification of the respondents. It could be deduced from the results that our sampled physicians were not aware of the patients’ rights, especially the right to confidentiality. Medical treatment of the patient was more important for them rather than issues related to rights and confidentiality. Cultural influences sometimes override professional considerations. Perhaps that was the motivating factor for sharing patient information more with relatives than with the patient. Cultural considerations could strongly influence decision making processes about breaking bad news. Cultures where family bonds are strong and families are predominantly patriarchic, such as Saudi culture, tend to place the decision making with elders of the family without really caring about rights or confidentiality. Physicians have to comply with the cultural norms. This situation is compounded by the lack of training in breaking bad news. It increases the vulnerability of the physician to difficult situations and he or she is likely to find it easier to share patient related information with families or relatives without asking for the patient’s permission. 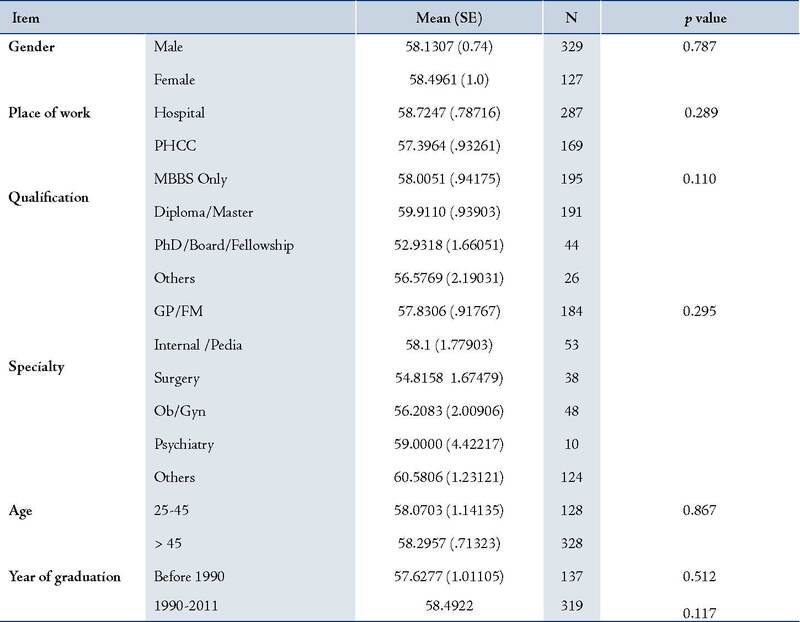 In our study, junior physicians had better scores than seniors; this could be due to the fact that medical schools now incorporate BBN in the undergraduate curriculum.27 Traditionally, medical schools devoted more time towards teaching medical skills rather than communication skills. However, this trend is changing. Modern curricula have realized the importance of effective communication between physicians and are giving due importance to this skill. Other limitations which should also be noted are; the instrument used needed to be improved to cover more important aspects in patient-doctor communication related to BBN, or an in-depth study on a single aspect. Further research is needed to study this important issue in our practice, a qualitative study may be more helpful. We conclude that the issue in Saudi Arabia is still "whether" rather than "how" to inform the patient. This is true for our study as well as in similar studies conducted in Saudi Arabia. We believe that although the physicians are keen to help their patients, most of them lack the essential knowledge and skills of breaking bad news. BBN should be ideally a skill learned at medical school. Practicing physicians at all levels should be trained in the skills required for breaking bad news. The authors would like to thank the study participants for taking the time to complete the questionnaire. No conflicts of interest or funding to disclose. 1. Dickson D, Hargie O, Brunger K, Stapleton K. Health professionals’ perceptions of breaking bad news. Int J Health Care Qual Assur Inc Leadersh Health Serv 2002;15(6-7):324-336. doi:10.1108/09526860210448492. 2. Alrashdi I. Evaluation of quality of healthcare: to what extent can we rely on patient expectations and preferences. Oman Med J 2012 Nov;27(6):448-449. 3. Al-Wahaibi A, Almahrezi A. An application of educational theories and principles of teaching and learning communication skills for general practitioners in oman. Oman Med J 2009 Apr;24(2):119-127. doi:10.5001/omj.2009.26. 5. Bedikian AY, Saleh V, Ibrahim S. Saudi patient and companion attitudes toward cancer. King Faisal Spec Hosp Med J 1985;5:17-25. 6. Mobeireek AF, al-Kassimi FA, al-Majid SA, al-Shimemry A. Communication with the seriously ill: physicians’ attitudes in Saudi Arabia. J Med Ethics 1996 Oct;22(5):282-285. PMC free article. PubMed. 7. Younge D, Moreau P, Ezzat A, Gray A. Communicating with cancer patients in Saudi Arabia. Ann N Y Acad Sci 1997 Feb;809:309-316. PubMed. 8. Mobeireek AF, Al-Kassimi F, Al-Zahrani K, Al-Shimemeri A, al-Damegh S, Al-Amoudi O, et al. Information disclosure and decision-making: the Middle East versus the Far East and the West. J Med Ethics 2008 Apr;34(4):225-229. PubMed. 9. Al-Amri AM. Cancer patients’ desire for information: a study in a teaching hospital in Saudi Arabia. East Mediterr Health J 2009 Jan-Feb;15(1):19-24. PubMed. 10. Aljubran AH. The attitude towards disclosure of bad news to cancer patients in Saudi Arabia. Ann Saudi Med 2010 Mar-Apr;30(2):141-144. 12. Rabow MW, McPhee SJ. Beyond breaking bad news: how to help patients who suffer. West J Med 1999 Oct;171(4):260-263. 13. VandeKieft GK. Breaking bad news. Am Fam Physician 2001 Dec;64(12):1975-1978. 14. Annunziata MA, Foladore S, Magri MD, Crivellari D, Feltrin A, Bidoli E, et al. Does the information level of cancer patients correlate with quality of life? Aprospective study. Tumori 1998;84:623. 15. Mystakidou K, Parpa E, Tsilila E, Katsouda E, Vlahos L. Cancer information disclosure in different cultural contexts. Support Care Cancer 2004 Mar;12(3):147-154. 16. Al-Ahwal M. Cancer patients’ awareness of their disease and prognosis. Ann Saudi Med 1998 Mar-Apr;18(2):187-189. 17. Fallowfield L, Jenkins V. Communicating sad, bad, and difficult news in medicine. Lancet 2004 Jan;363(9405):312-319. 19. Ha JF, Longnecker N. Doctor-patient communication: a review. Ochsner J 2010;10(1):38-43. 20. Buckman R. Communication in palliative care: a practical guide. In: Dickenson D, Johnson M, Katz JS, eds.Death, Dying and Bereavement. 2nd edn. Sage, London 2000:146-73. 21. Ptacek JT, Eberhardt TL. Breaking bad news. A review of the literature. JAMA 1996 Aug;276(6):496-502. 22. Buckman R. Breaking Bad News: A Guide for Health Care Professionals. Baltimore: Johns Hopkins. 23. Baile WF, Buckman R, Lenzi R, Glober G, Beale EA, Kudelka AP. SPIKES-A six-step protocol for delivering bad news: application to the patient with cancer. Oncologist 2000;5(4):302-311. 25. Saudi Ministry of Health, Administrative Policy and Procedure titled ‘Patient Rights and Responsibilities’, Policy number ICU-APP-MOH-005E(1) of 01-09-1432, Section 5.8 - Right to Confidentiality, para 5.8.2. 27. Simmenroth-Nayda A, Alt-Epping B, Gágyor I. Breaking bad news - an interdisciplinary curricular teaching-concept. GMS Z Med Ausbild 2011;28(4):Doc52. 29. Visser, Penny S, Krosnick JA, Marquette J, Curtin M. Mail Surveys for Election Forecasting? An Evaluation of the Colombia Dispatch Poll. Public Opin Q 1996;60:181-227. 30. Cook JV, Dickinson HO, Eccles MP. Response rates in postal surveys of healthcare professionals between 1996 and 2005: An observational study. BMC Health Services Research. 2009; 9:160 doi:10.1186/1472-6963-9-160.This article is available from: http://www.biomedcentral.com/1472-6963/9/160.